LOUISVILLE, Ky. — A federal judge has granted a temporary restraining order that prevents 10 individuals who had been arrested in May for blocking the doors of Kentucky’s last abortion facility from doing so again this weekend during a pro-life rally in Louisville. U.S. District Court Judge David Hale, appointed to the bench by then-President Barack Obama, issued the order on Friday at the request of the federal government. “The United States has demonstrated the imminent risk of irreparable injury in the form of interference with EMW’s patients’ and their escorts’ access to reproductive health services; interference with EMW’s provision of reproductive health services to its patients; and risks to public safety, all injuries which cannot be fully compensated through monetary damages,” he wrote. “Defendants … are hereby temporarily restrained from using physical obstruction to intentionally interfere with any person, or attempting to intentionally interfere with any person, because the person was or had been obtaining or providing reproductive health services at EMW,” Hale said. 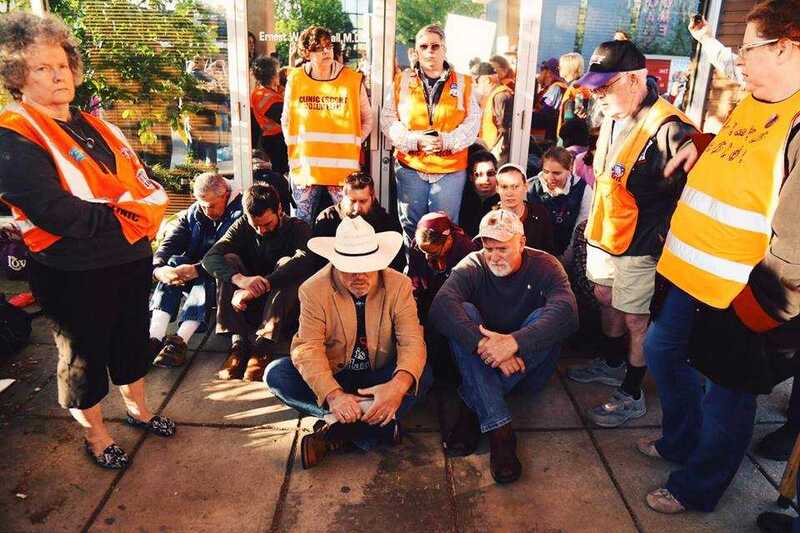 He also granted a request for a buffer zone that would keep the 10—and anyone participating in the event—from coming onto the abortion facility property. Hale noted, however, that his order “does not restrict any of the rights of the defendants, including their First Amendment rights, outside the zone.” He stated that it likewise is not applicable when the business is closed. While organizers of Operation Save America’s event, which runs through July 29, did not plan to block the doors during the gathering, Joseph Spurgeon, the pastor of Sovereign King Church and a local leader for Operation Save America, noted on social media on Saturday that the government still sent federal marshals to keep pro-lifers away from the facility. “The federal government, ran by Donald Trump, is serious about protecting baby murder. The U.S. marshals had the abortion mill surrounded to protect it today,” he wrote. Spurgeon also lamented efforts to keep Christians away from the building during a press conference on Wednesday. “Church-going men and women in Louisville and the surrounding area in both Kentucky and Indiana who come out to plead with women not to get an abortion, who hold signs depicting both the gruesome reality of murder and the beauty of life, and who preach the gospel, are now considered far more dangerous than the ones who are killing innocent children,” he declared. The federal government, which requested the buffer zone this week under the Freedom of Access to Clinic Entrances Act (FACE), signed into law by then-President Bill Clinton, has also asked Judge Hale to order the 10 to pay monetary damages to those who were unable to use the abortion facility in May because the doors were blocked.